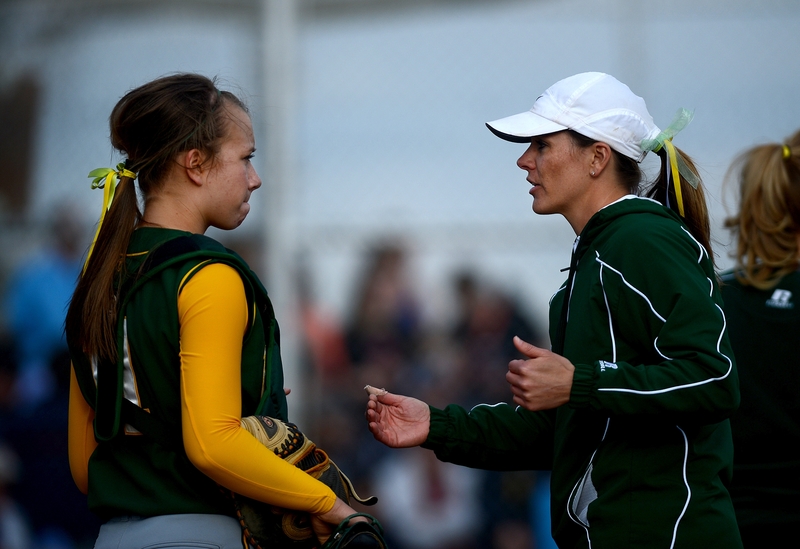 CMR coach Lindsey Graham talks to her catcher Erika Lankford in between innings on Thursday afternoon. Good pitching beats good hitting, the adage goes. Quinn Hartman proved that Thursday. The C.M. Russell High sophomore surrendered two first-inning runs on a two-out bloop single, and then proceeded to shut down the hot-hitting Great Falls High Bison on four hits the rest of the way in a 6-2 complete-game victory. Hartman also did damage at the plate as she drove in three runs on a pair of timely hits. It certainly was the sophomore’s day. “I guess – I ate my Wheaties,” she quipped afterward. She also had her changeup working en route to five strikeouts. The early 2-0 deficit ignited the Rustlers, who seem to thrive on playing from behind. The victory over their crosstown rival keeps the Rustlers in at least a tie for the top spot in the Eastern AA standings at 3-0. It’s also their sixth straight win and sets up another showdown this weekend against Billings West at Multi-Sports Complex. The Bison need to sweep Bozeman to stay in the hunt. GFH is 9-2 overall and 4-2 in conference play.